Cathy conjured up the idea of Spring in our nation’s capital, with a side trip to visit Aunt Tilda in Williamsburg. Plans laid on, including a visit, at last, to the Smithsonian’s Steven F. Udvar-Hazy expansion to the Air and Space Museum for me, a pilot’s pilgrimage to Mecca. Unfortunately, as we sat in the boarding area awaiting our flight, cancellations on other departures filled our plane to the exclusion of mere Space Available retirees like the three of us. Well, house/Sawyer sitters had been arranged, and ol’ What’s Her Name had time off from her SDSU class demands, so couldn’t we please find somewhere else to go? A day later we were set for a visit to Granada, Nicaragua, and surrounding regions. When it comes to travel pangs, you have to be light on your feet around Cathy. 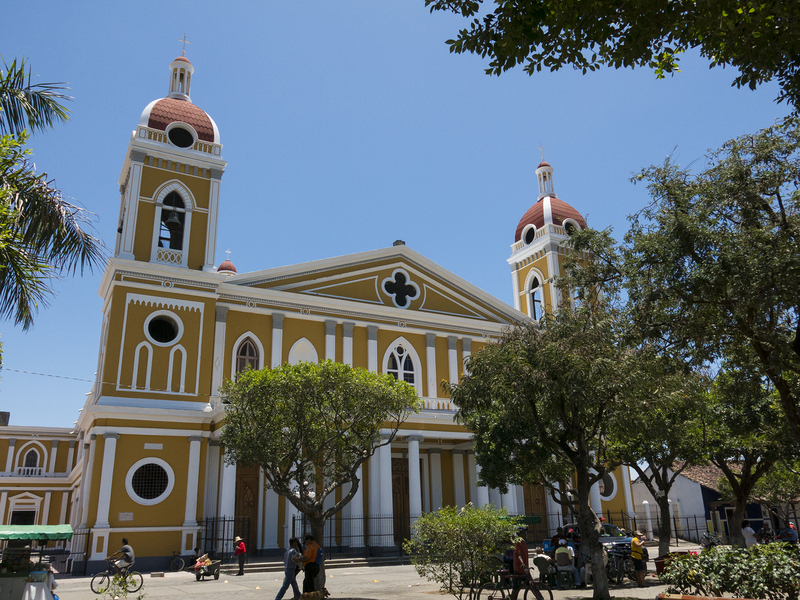 Granada, population on the order of 120,000, is a Spanish colonial city dating from 1524, on Lake Nicaragua, about 45 minutes south of Managua by car. 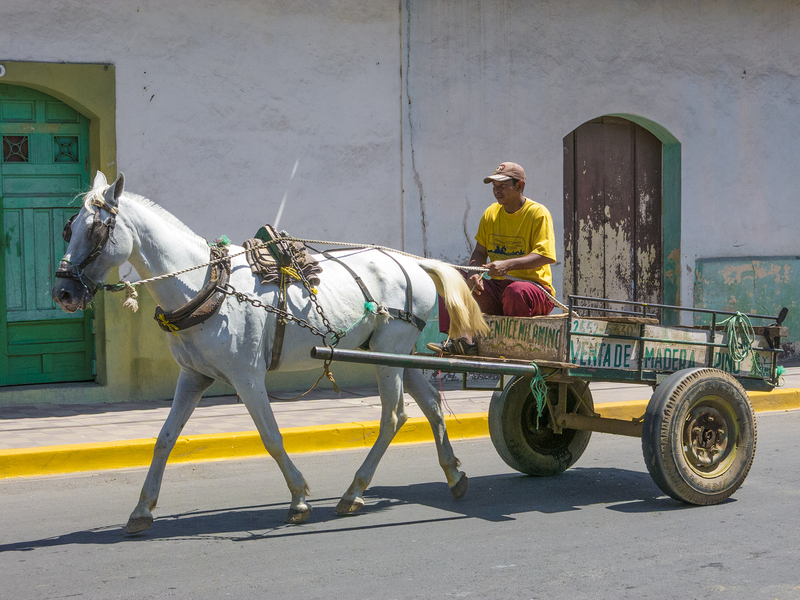 That we could actually find space on United airplanes to and from Nicaragua was both something of a miracle, and should have been a heads-up clue as to the climate in April—the end of the dry season, and just plain hot and clear-skied day in and day out. Dawn temperatures were all the way down to the upper 70s, with mid afternoon routinely hitting the upper 90s. But this was dry heat with regular breezes, shade that could be sought out, ceiling fans, not to mention cold libations. Glad we didn’t know in advance, because the trip was just dandy once we got there. We’d found a VRBO house, a short walk from the town’s central park. A plus on this rental was Julio, the Chicago owner’s local agent, who was keen to provide us transportation, and tourist help from his indigenous perspective. His assistance included picking us up at the Managua airport at our 9:30 PM arrival. 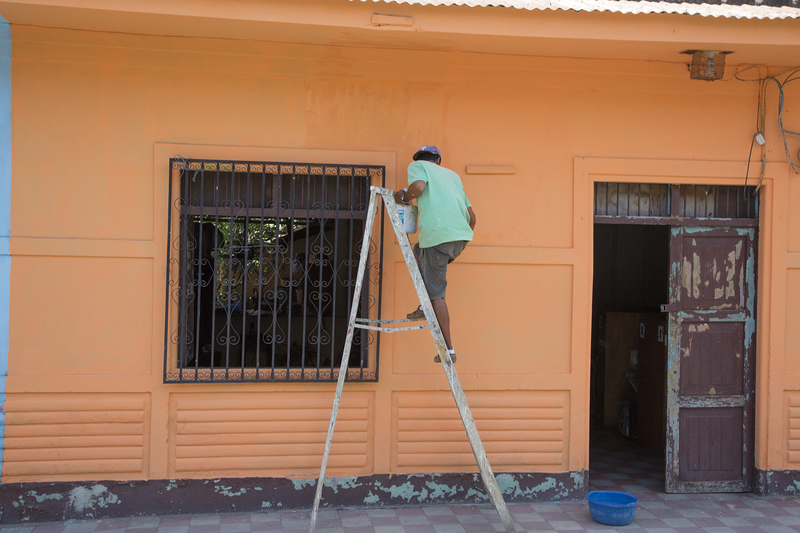 This relationship provided our first glimpse of the warmth of the Nicaraguan people, right from the get-go. 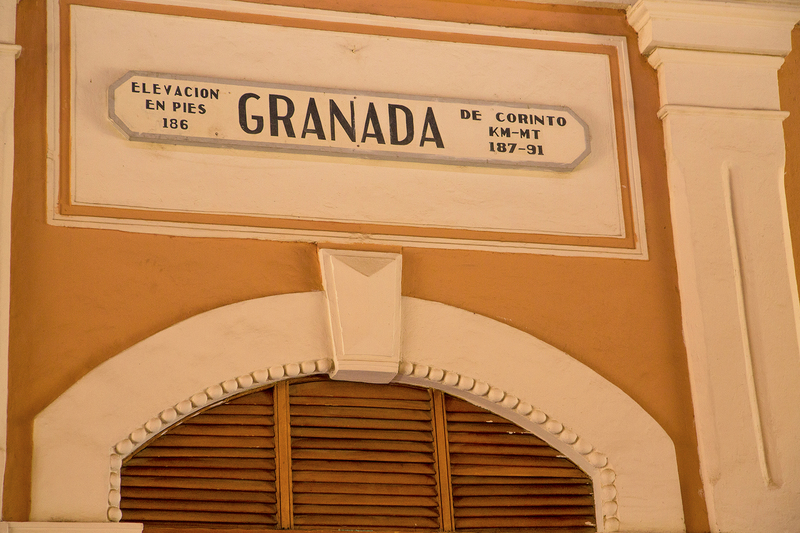 As we reached the Immigration officer’s desk for admission to the country, we nearly foundered on a modest detail we’d not covered—the address of the Dos Palmas rental home in Granada. This entirely stopped that immigration line, with me discussing in my best Spanish our plans, propmting the Nicaraguan officer to call over an assistant to take me outside and find Julio awaiting us curb-side with a hand lettered “Close, Caty” sign. That’s the only way I knew who Julio was, and he and the assistant quickly covered the details, after which the latter took me back through the labyrinth of the airport’s inner corridors to the immigration officer patiently waiting for us. Smiles and thank-yous all around, and the passports were stamped and we were welcomed to Nicaragua. Throughout our stay, the populace again and again demonstrated their friendly, patient, and industrious ways. Speaking of industriousness, wherever you looked people were making a living in ways as old as the ascendancy of humans over beasts of burden. And when beasts aren’t in the cards, there’s always the bicycle or feet. Presumably this will not be a last minute news flash for those of you who know me, but Tom, is always gaga over color. 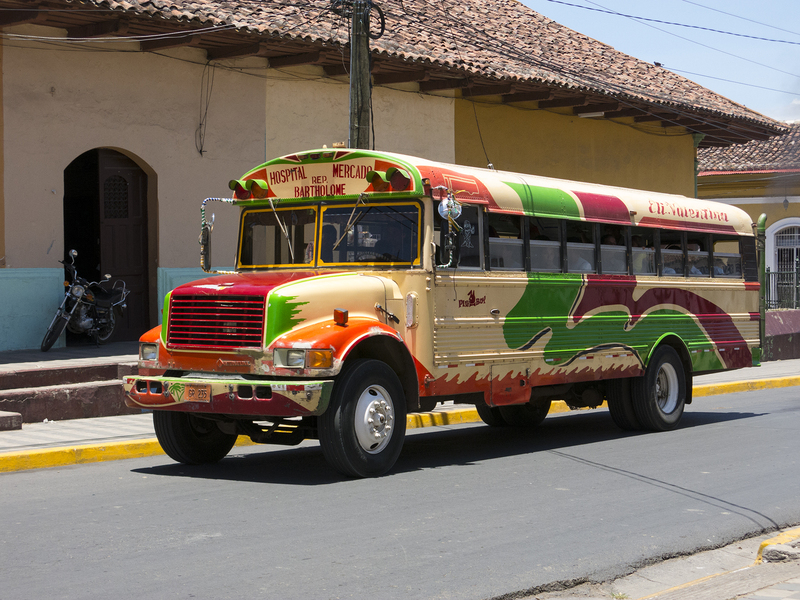 And Latin America and I have held a long-requited love affair over colors. Granada is very much the rule, not the exception. Yum. What sounded hokey when Julio mentioned it, turned out to be a real treat for exploring the byways of Granada. 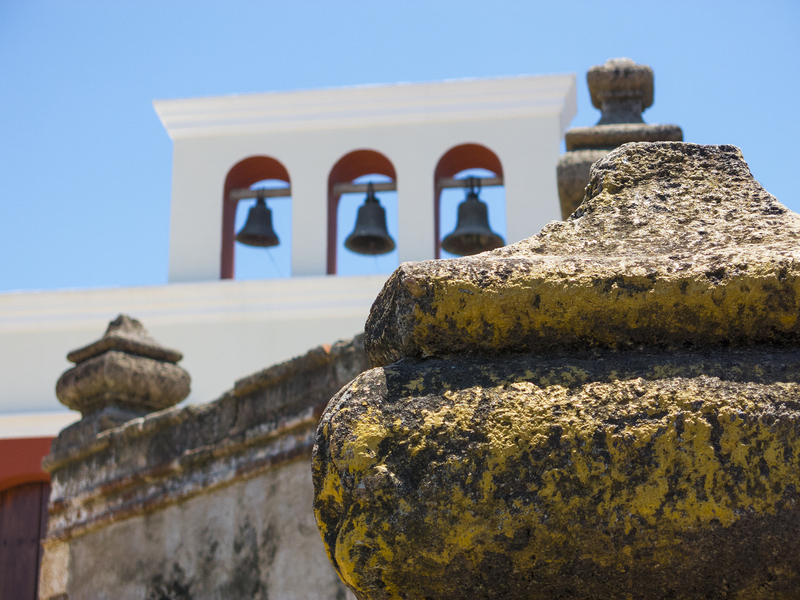 We began with a visit to a local church, and a climb to its bell tower to take in the 360º vista, followed by a multiple hours’ carriage ride. 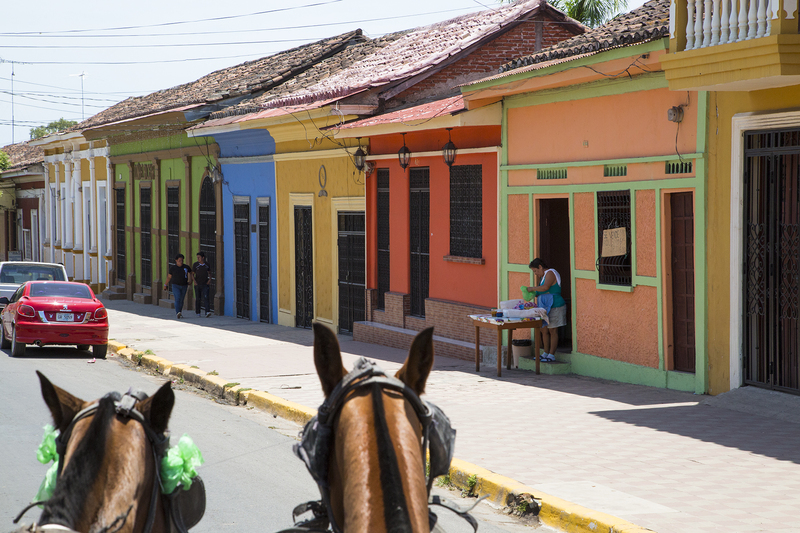 Even the horses were colorful. With a latitude of 12º north, volcanic soil and rain (except when we were there), tropical fruits are abundant. 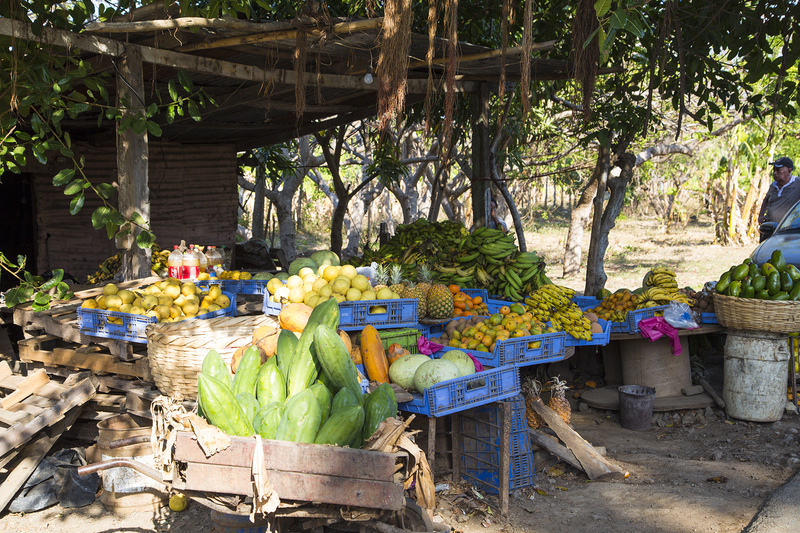 The industrious fruit vendors sell delicious fruits and delights for the eyes. 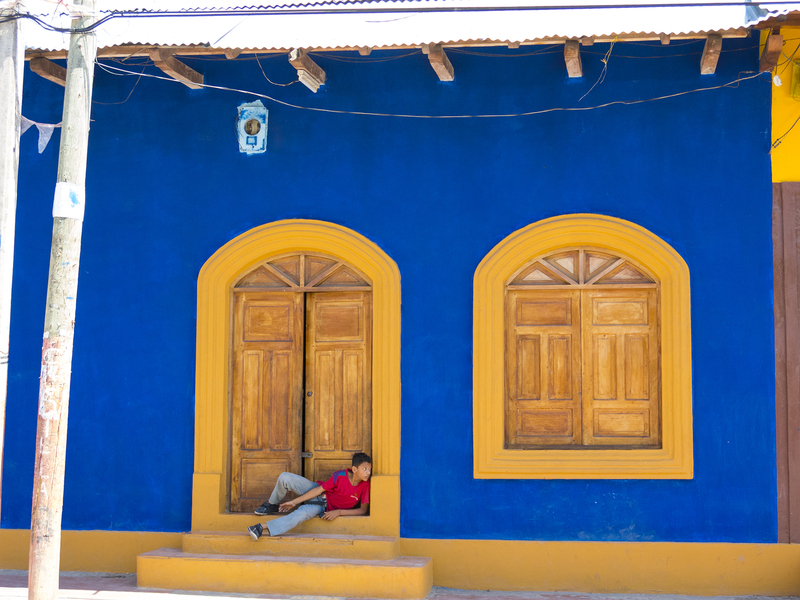 As you might guess, the people are as colorful as their communities. In multiple locales we saw young people energetically whirling in costume to the beat of raucous drumming. Exercise and income for them, entertainment for us. This scene is along Avenida Guzman, if I recall correctly—a couple of blocks of which are dedicated to outside dining and pedestrians only, a happening place at the dinner hour. The figure in the distance would appear to be a ten-foot tall woman with whirling skirts, but the effect is produced with a dress-draped mannequin of sorts, “stretched” vertically with a frame, held up by a youngster underneath, who feverishly spins the contraption. In the foreground it is a tiny elementary school-age kid ensconced in what must have been a large papier maché mask, spinning so fast as to literally blur before the eye. Can you guess how hot it must have been in these props, not to mention the dizziness of it all? You can bet that these folks have never heard of minimum wage, OSHA, or child labor laws. 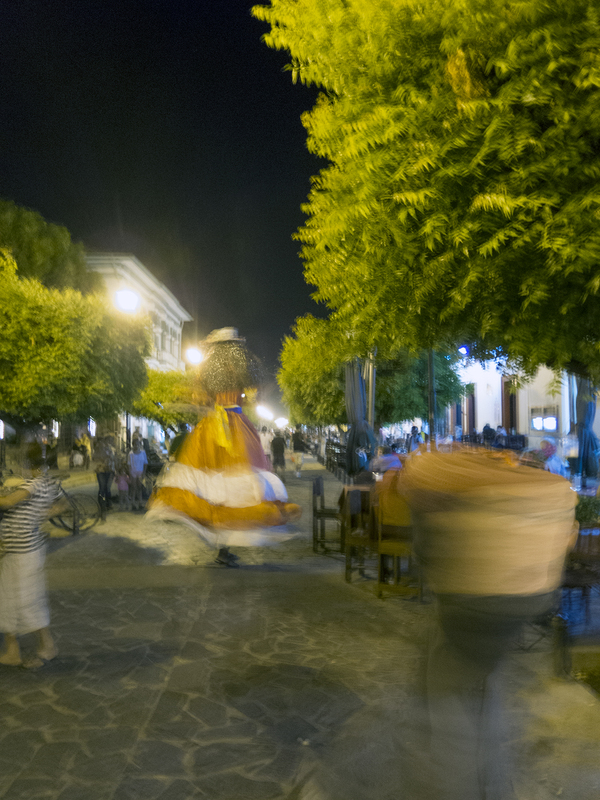 Late one afternoon while visiting artisans in one of the Pueblos Blancos, or White Villages, I stepped out to sit in the breeze, to be treated to this street parade. 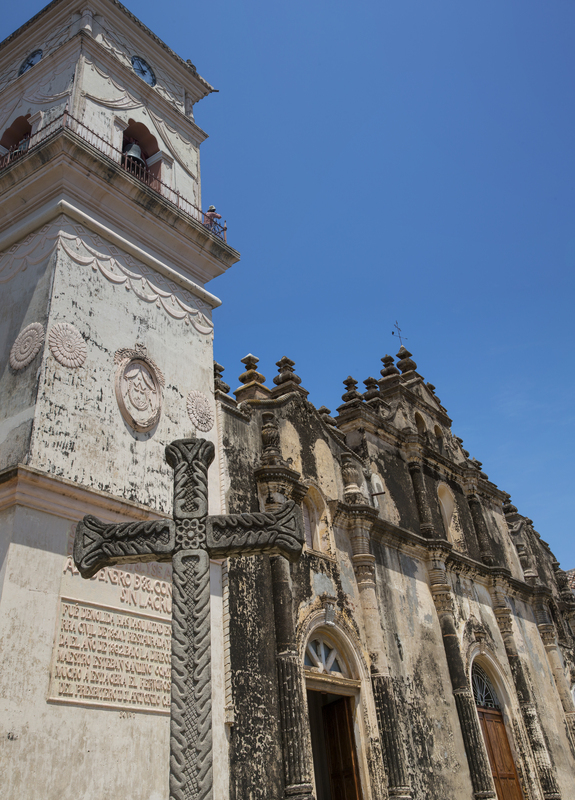 Nicaragua is a deeply Catholic country, and we were there during the Lenten season, just ahead of the beginning of Semana Santa, or Holy Week. 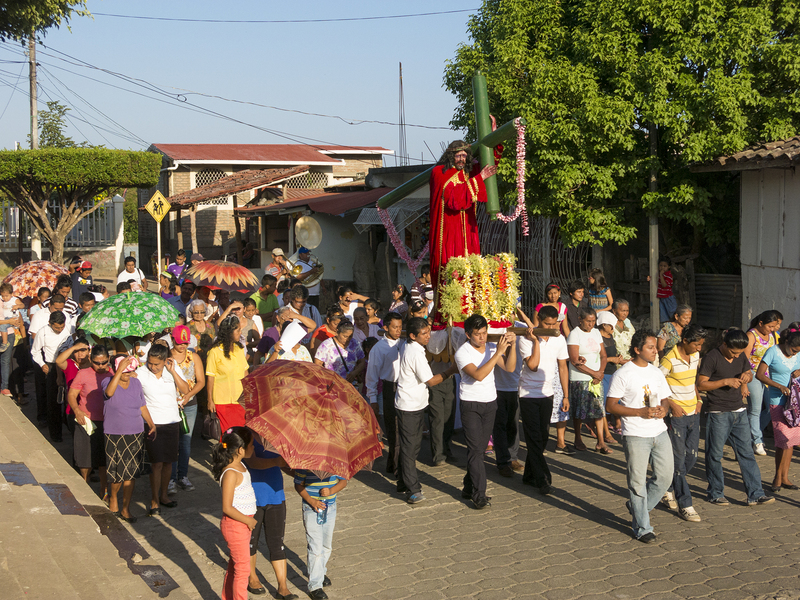 Neighborhoods all over had versions of this, a statue of a colorful, bloodied Christ carrying the cross to his crucifixion. Local priests would preach on something biblical, and then the group would begin marching forward to band accompaniment. 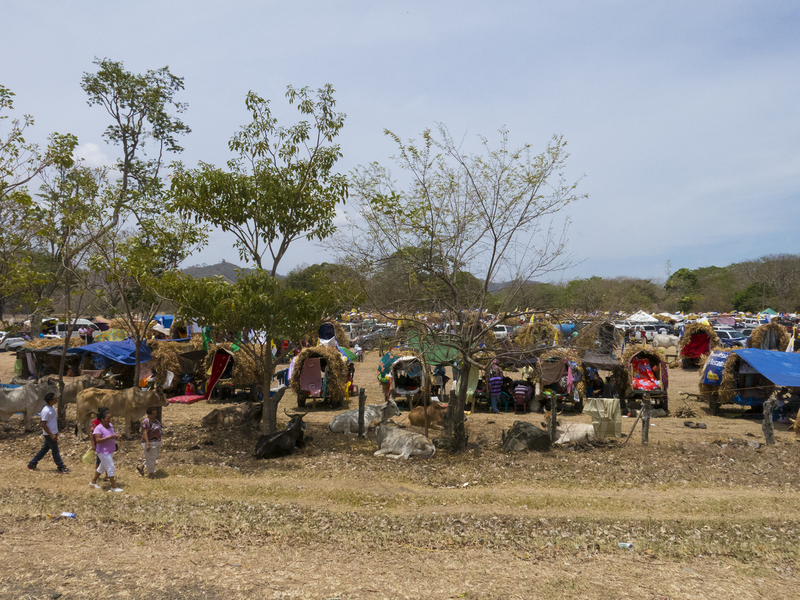 In a modestly similar vein, we encountered this large group pilgrimage along the road from Granada to San Juan del Sur, a beach community on the Pacific near the border with Costa Rica. We were told that the entire group proceeded hundreds? of kilometers, one day at a time, taking their animals and camps with them. Lest the caption be too esoteric, RAGBRAI refers to the (Des Moines) Register’s Annual Great Bike Ride Across Iowa, a weeklong block party by bike. There are literally hundreds of travelers with their livestock in this large open field. Herewith, images generally describable as local color shots, figuratively, although literally, in the bargain. During our carriage ride we proceeded to the original Granada train station, now a museum of sorts, from whence came the first picture in this post. 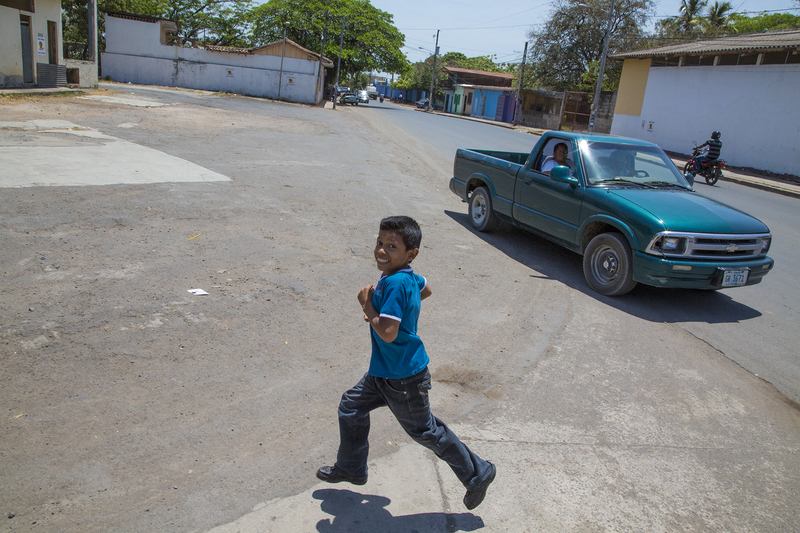 Clopping along the street, this young lad ran alongside just because he could. What a grin. Now, as I say, the days were downright hot, and the relative cooling of evenings made being outside a family affair all along the streets of Granada. 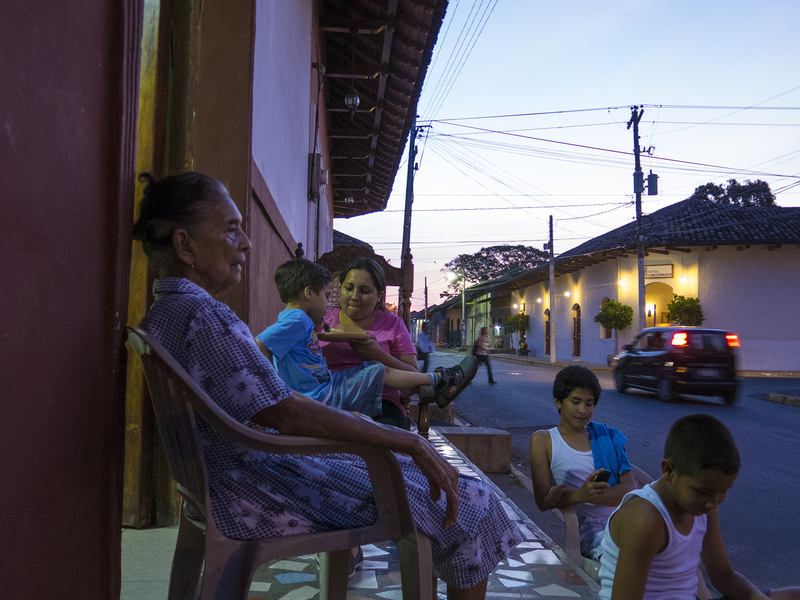 The sun having just set, twilight coming on, this family was relaxing across the street from what became our favorite watering hole, the bar at the Hotel Corazon, a couple of blocks from our local digs. “Un foto de su familia con la puesta del sol, y luz hermosa?” “Claro que sí.” Street photographer daughter, Torrey, is much more surreptitious than my “go direct” approach. Different strokes for different folks. The large cathedral adjoining Granada’s central park. Below, the view from the bell tower above, and from whence we began our carriage ride around town. 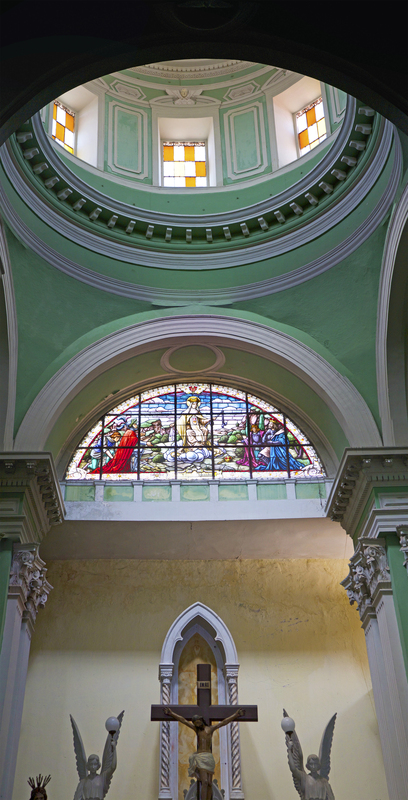 The cathedral is a couple of blocks away, and Lake Nicaragua is visible above the rooftops in the distance. Perhaps you are aware that Central America is Exhibit Number One to Plate Tectonics? If it wasn’t for the crunching of plates and its coincident volcanism, shippers wouldn’t need the Panama Canal. It would be ocean from Mexico to South America. This plays out with numerous volcanos, active and dormant throughout Nicaragua. 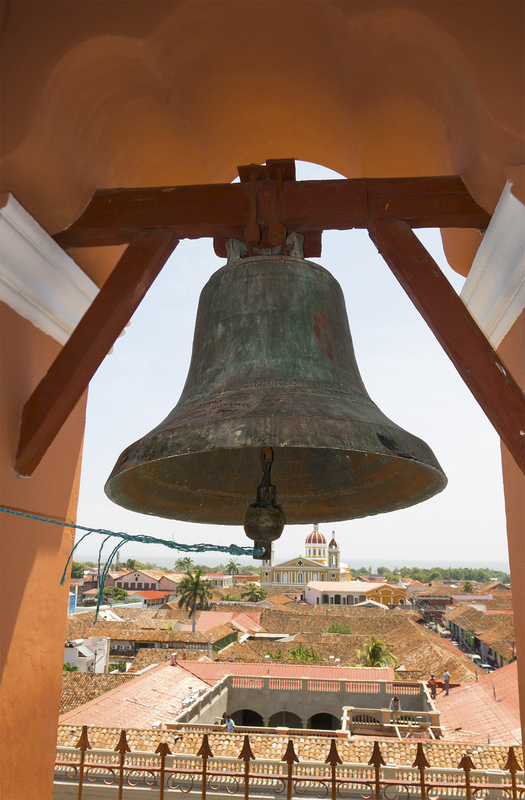 There’s a Volcanos National Park just outside of Granada, close enough for an easy day trip. The museum headquarters is very nicely put together, including this nifty diorama that more or less tells it like it is. 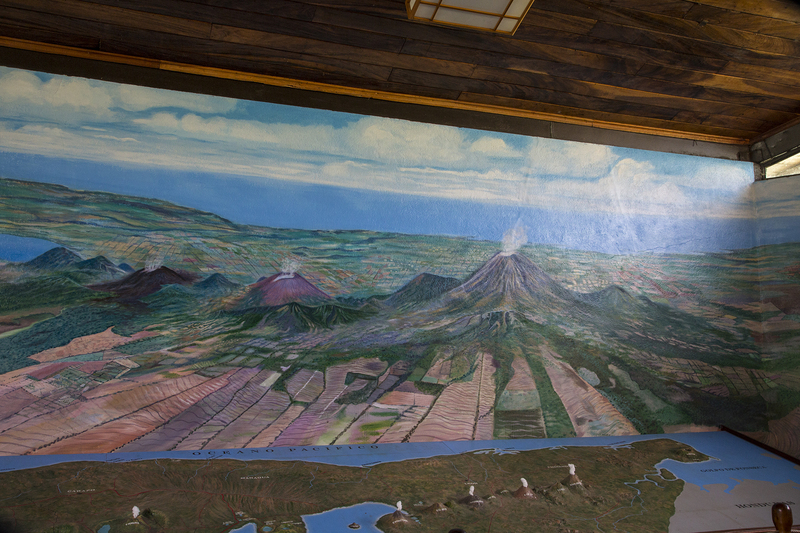 That’s a painting on the wall, with a view looking west toward the Pacific, and a clay topographic map in the foreground. Check out all the white cotton plumes emanating from the model’s volcanos. In case you need a more upfront example of this, there’s always the park’s Masaya Volcano. Julio drove us up to the volcano, and you can look right into its sulfurous maw, and get a whiff of magma halitosis. 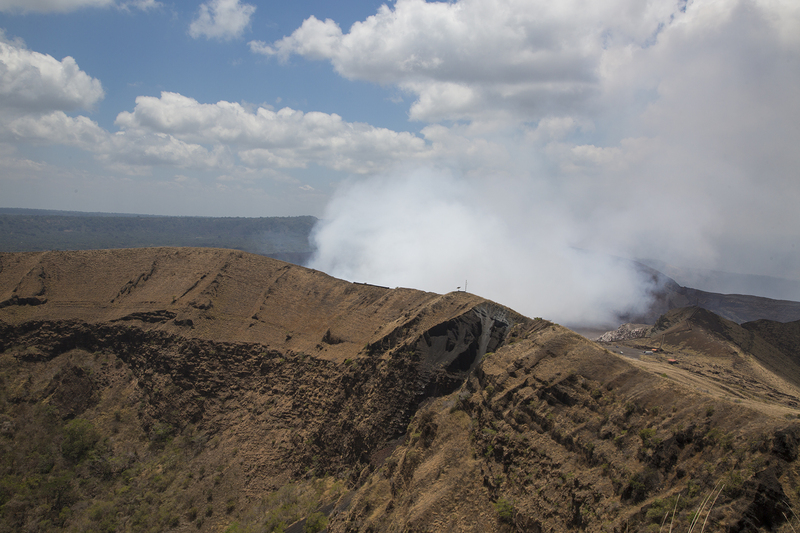 It was a bit of a photographic letdown because you are effectively in the plume while standing there at the edge of the active part of Vulcan Masaya, known as Santiago vent. So I elected to hike up the face of the adjoining volcano, which is currently dormant, for the perspective above. You can see the rim of the dormant portion of the volcano in the foreground, with Santiago’s plume emanating from its own caldera in the distance. Cathy, Torrey, and Julio indulged me on this longish hike to heed the creative muse in me—a steep and slippery climb of some duration. 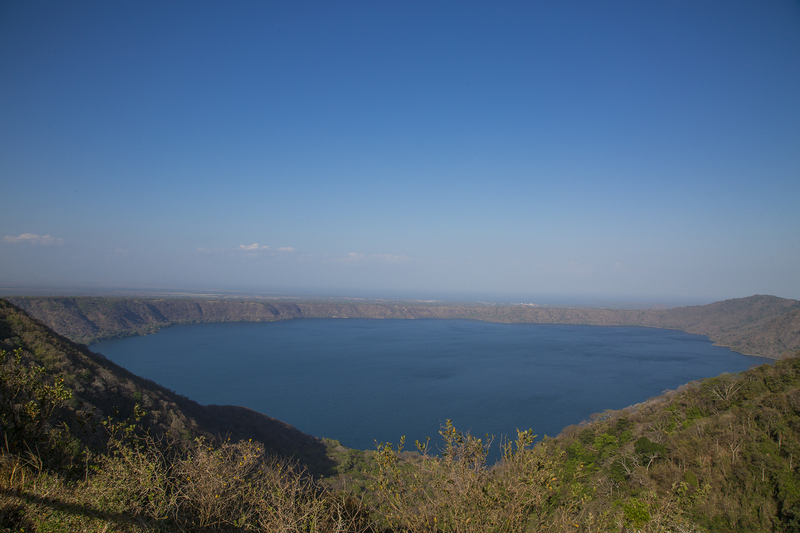 Some craters collapse and form lovely lakes, such as Apoyo, above. 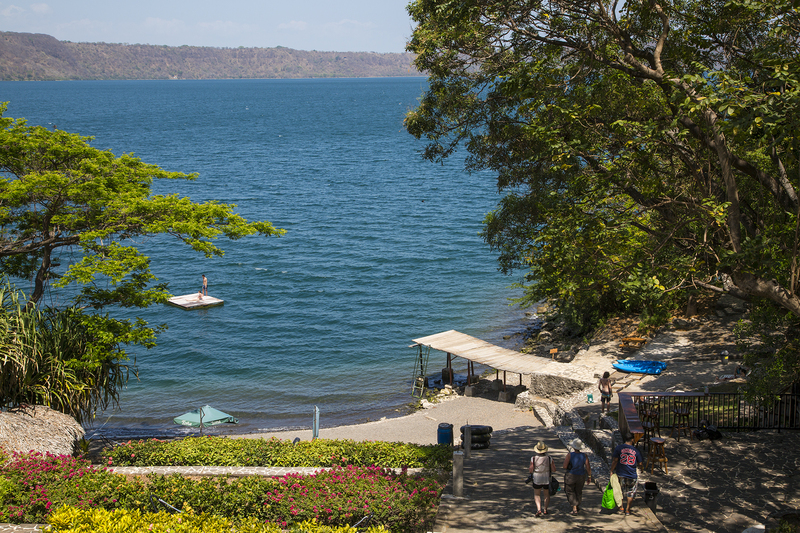 Not missing an opportunity when they see it, the Nicaraguans have developed lovely small spas and resorts along the edge of the lake. The water is warm, and the cerveza is cold. Below, Cathy and Torrey making their way to the cantina, where we treated ourselves to lunch and libations, followed by refreshing inner tube floating in the waters. 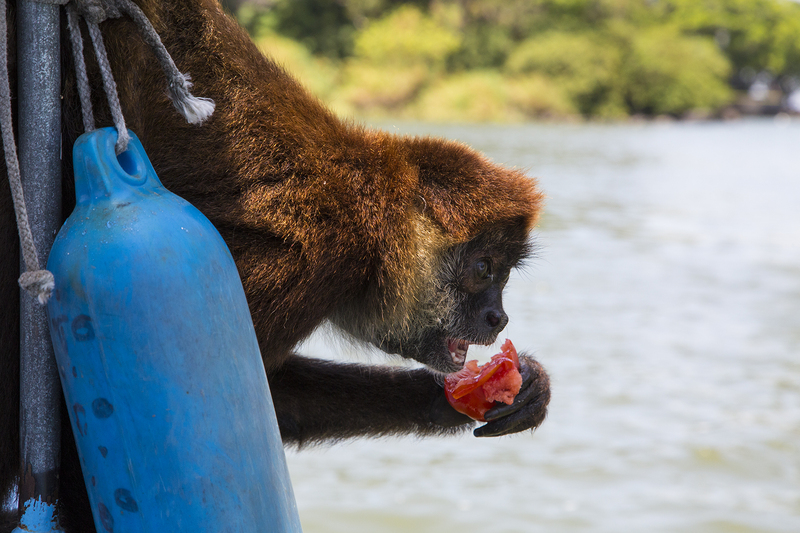 We ended our carriage ride through Granada at a modest dock at Lake Nicaragua, where we boarded a panga, or small boat, to visit a labyrinth of tropical isletas, a cross between something from Pirates of the Caribbean, Jurassic Park, and Century 21 real estate. Homes on some, including a few rather sumptuous examples, but lots of growth and wildlife in the bargain. This would include Monkey Island, where our boatman, over time has befriended one particular monkey he calls Lucy, gaining her acceptance while he feeds her penchant for tomatoes. As we drew nigh, she swung from an overhanging branch and gave the boatman an affectionate hug before scampering over Cathy’s shoulder on her way to the bow to hang out and consume her treat. 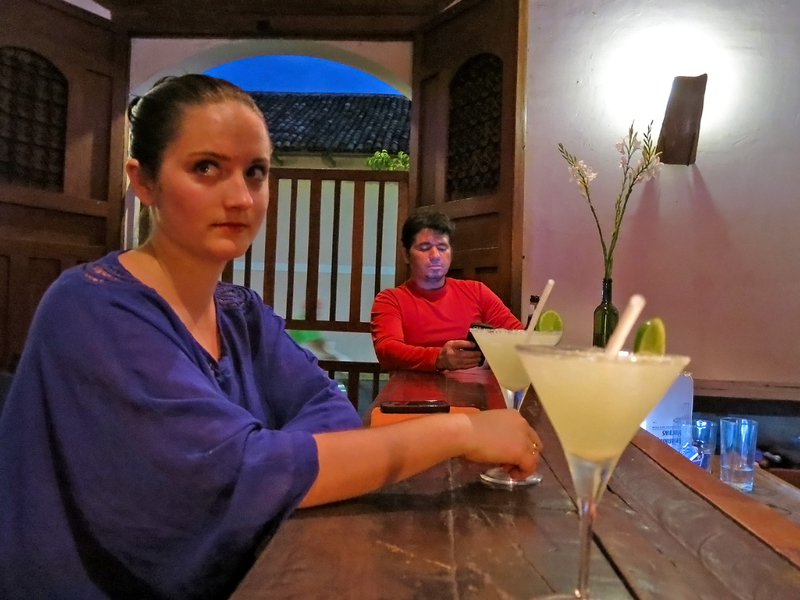 Now I shall move on to the shameless fruits of Gringo tourism. On our first morning in town, we took the advice of the owner of Dos Palmas and walked to Kathy’s Waffle Shop near the town’s central park. 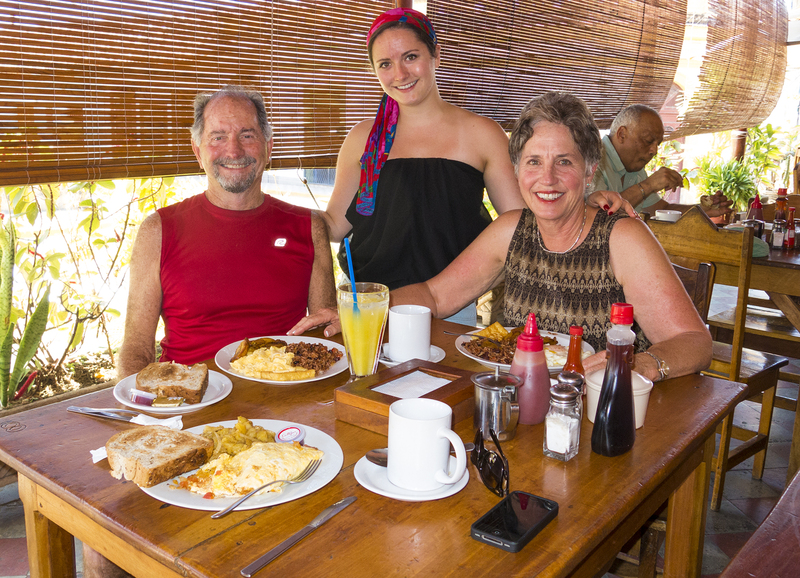 Much as I like waffles, we chose a typical Nicaraguan breakfast of juevos revueltos y gallopinto—scrambled eggs and a mixture of black beans, rice and spices common in this part of Central America. Fresh orange juice and a wonderful whole grain toast. Fried plantains, in the bargain, another Nicaraguan staple. Good to go for the next several hours. 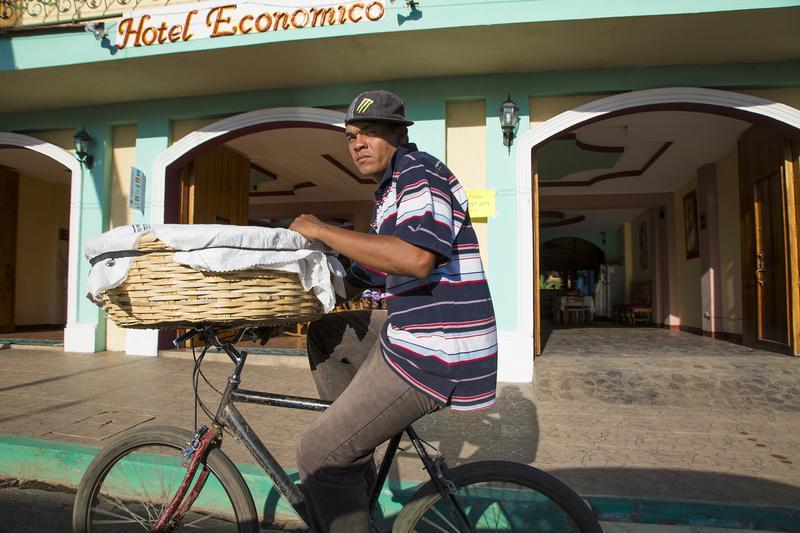 Our proximity to the bar at the nearby Hotel Corazon made us early evening “Cheers” regulars, night after night, and we struck up a marvelous camaraderie with barman José Luis, hand crafting the most delicious margaritas. No mixes—tequila, cointreau, and fresh limes, which he’d literally go pull off the tree when you ordered your drink, and slice and squeeze while fielding our Pavlovian salivating banter delivered with our best quasi effective Spanish. 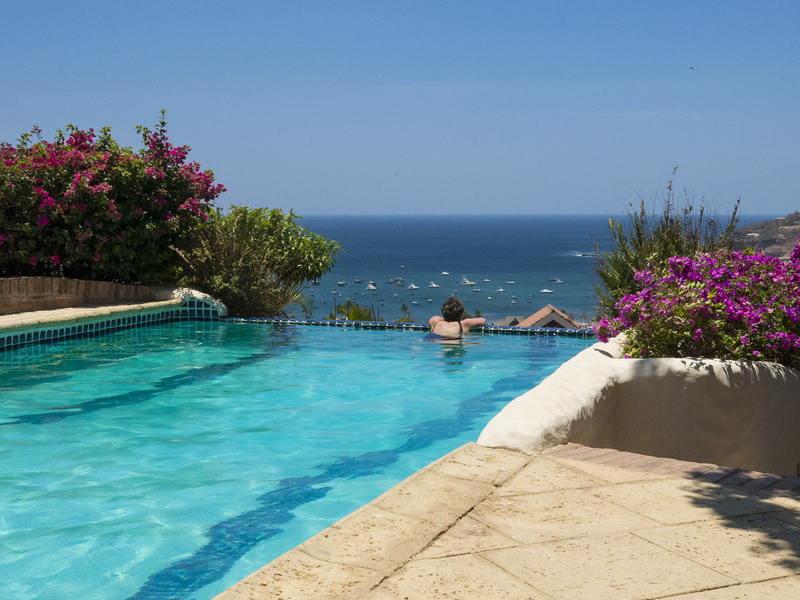 We felt we ought to at least explore someplace farther afield than Granada, and eventually decided on San Juan del Sur, on the Pacific near the border with Nicaragua. Cathy was researching an eco resort out in the toolies, when I put my foot down for a short dose of full decadence. We selected the Pelican Eyes resort, far and above the fanciest place in the region. The sunset view from our casita wasn’t too shabby, either. It’s a small natural harbor buttressed on both sides with headlands— on the right, a large Christ statue reminiscent of our time in San Sebastián, Spain. 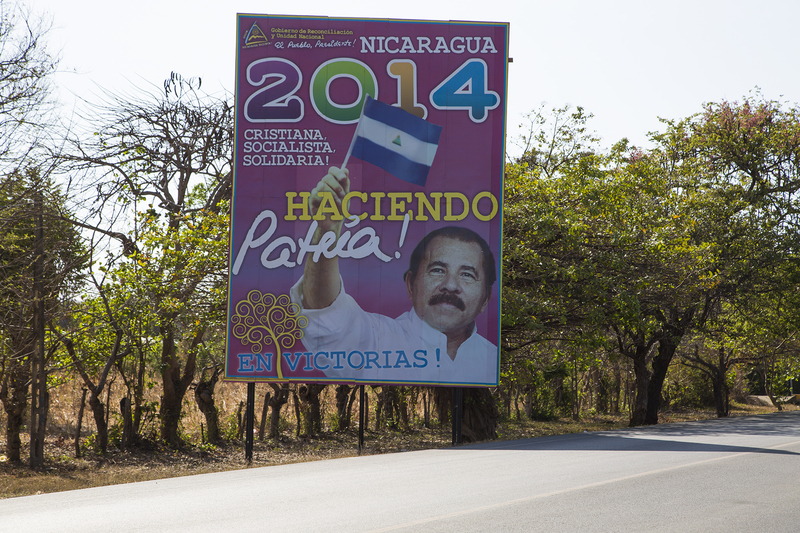 Mention of Nicaragua’s dark history is inescapable. I profess no expertise on this subject, but given the vibe with the people in these days of quiescence, I wonder if they haven’t been saddled with excess from both sides of the political spectrum. Our own country has had its fair share of interference in Nicaragua’s affairs, including U.S. Marines (long before Ollie North), endeavoring to put down a revolt against their presence in-country led by Augusto Sandino, whom our country referred to as a bandit, and who Julio likened to a Robin Hood. 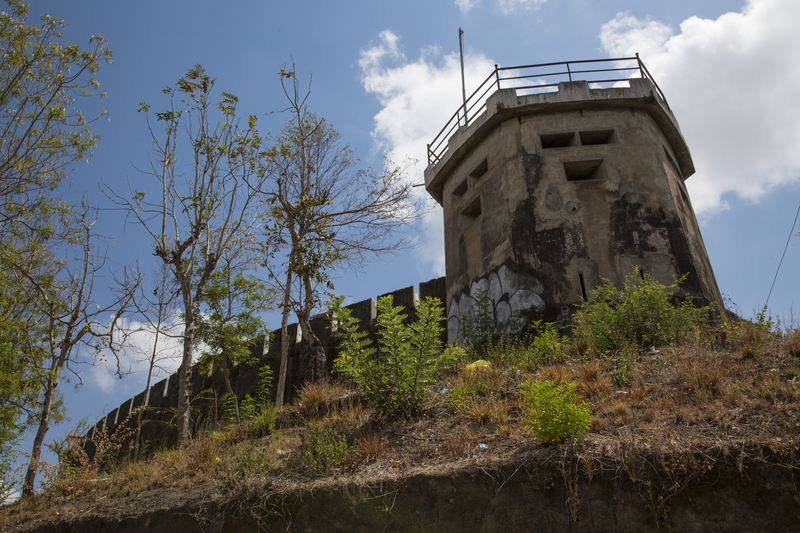 Sandino waged a guerrilla war against the Marines, who eventually left Nicaragua, probably a response to the fiscal realities of the Great Depression. 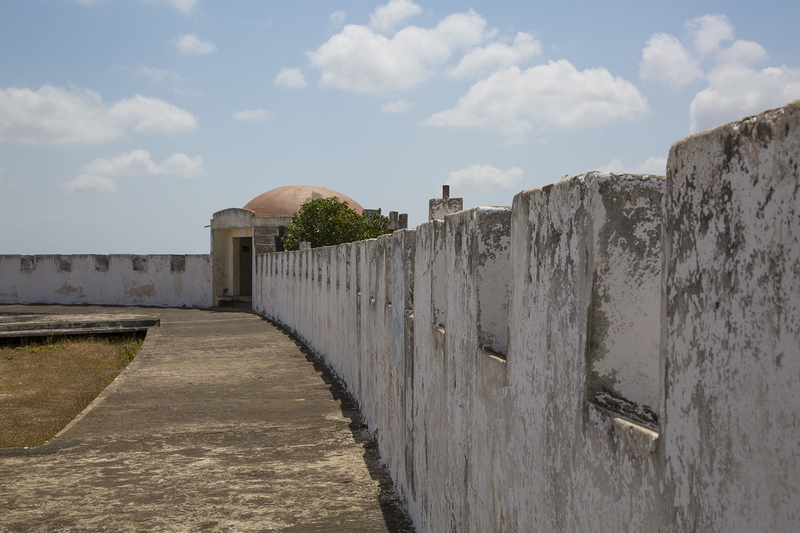 Before they left, the Marines oversaw the installation of Juan Sacasa, and, in 1934, Sandino was assassinated by forces under General Anastasio Somoza, who later took dictatorial power in a coup, and then elected as president in 1936. That was the extreme right government of Nicaragua until being overthrown by Marxist-Leninist Daniel Ortega’s Sandinista National Liberation Front in 1979. A dictator on the right replaced by one on the left. Ortega retained power until 1990. Since then he tried in 1996 and 2001 to return to power until successfully being reelected president of Nicaragua again in 2006. Make of all this what you will, Marine colonel Ollie North, overseeing the secret sale of arms to Iran, and using the funds to support anti-Sandinista contras in Nicaragua. Ortega, alleged to have sexually abused his adopted stepdaughter, evidencing favor of, and receiving succor from Iran’s Ahmadinejad, and Venezuela’s Chavez, and seeking to gain approval from Nicaragua’s judiciary to exceed current constitutional limits to terms in office. Julio thought we might find a visit to the hilltop fortaleza (fortress) not far outside Granada informative as to the recent political history of the country, and he was correct. This edifice has existed as a fortress, prison, and of late, a country home of the Boy Scouts. Go figure. This is the look as you climb the hill to the fortress, or prison site. If you were a guard, this might be a common view. And, then, they close the doors on you. 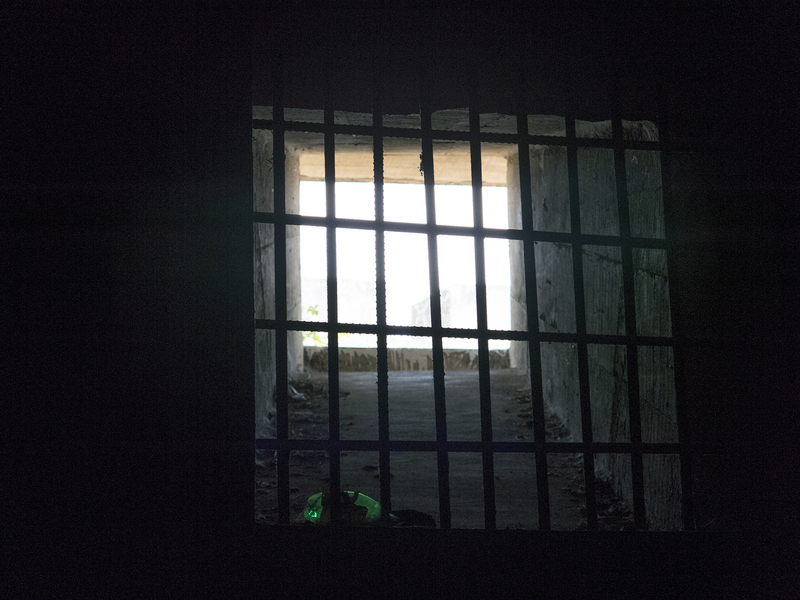 To give you a little idea of just how grim things could be for prisoners, this is a barred-off window, dimensionally about three feet by three feet, maybe nine feet above the floor of a cell for dozens of prisoners. 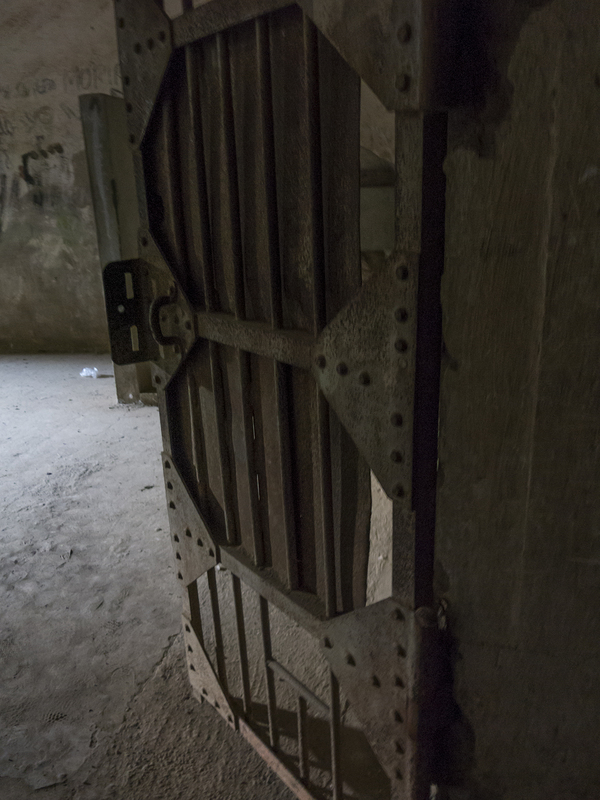 As it turns out, in some cases, the jailers installed three prisoners in the window cube, and closed off the outside. It gets even worse, like the excrement cell. Use your imagination. 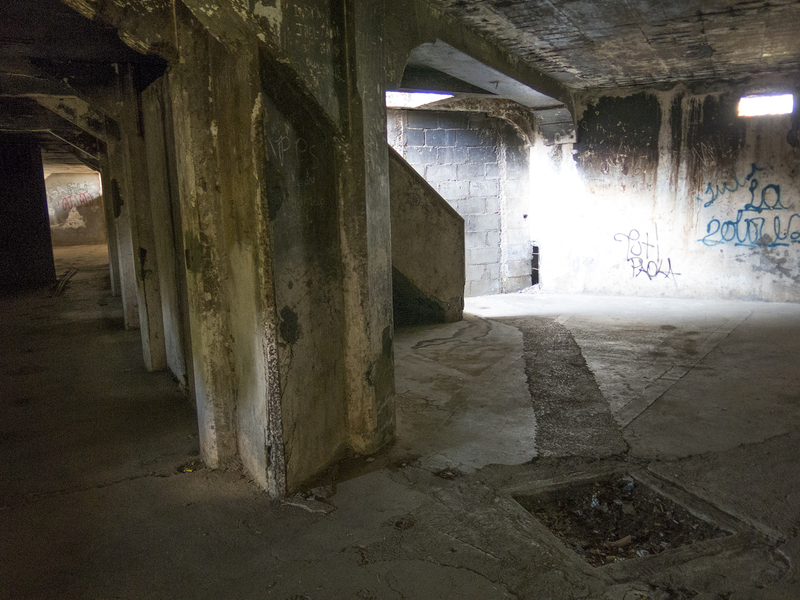 And the prison had three levels below ground, so the bottom two levels had no light whatsoever. Large numbers of internees were never seen again. Dead or alive, their bodies were tossed into handy active volcanos. Man’s inhumanity to man. Give praise to our own relative political stability, and take none of your freedoms for granted. Evil exists, and we humans have plenty of history to prove it. Last glimpses. Scattered throughout the towns and highways are billboards like this. 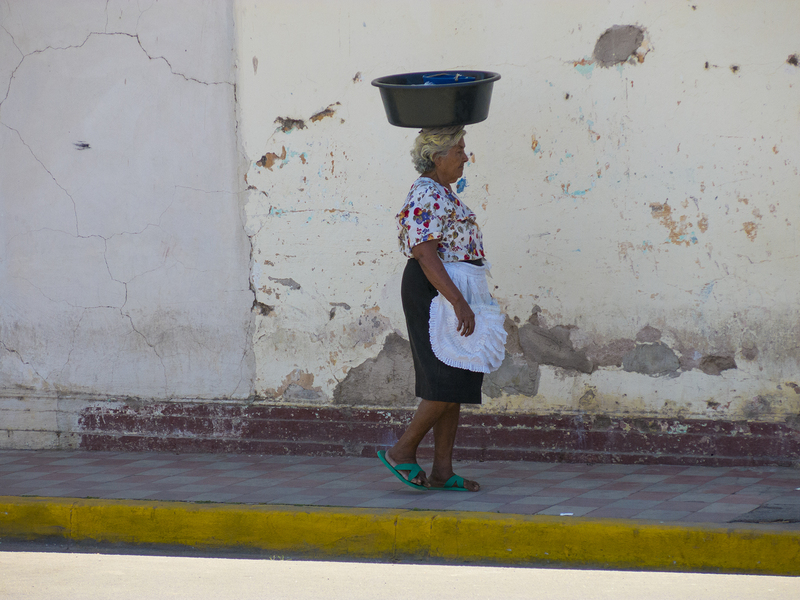 And a favorite glimpse of Nicaragua for me. Bags dropped with the desk staff of Pelican Eyes Resort, Cathy and I hiked down to the beach and decided on lunch at beachfront el Timón. 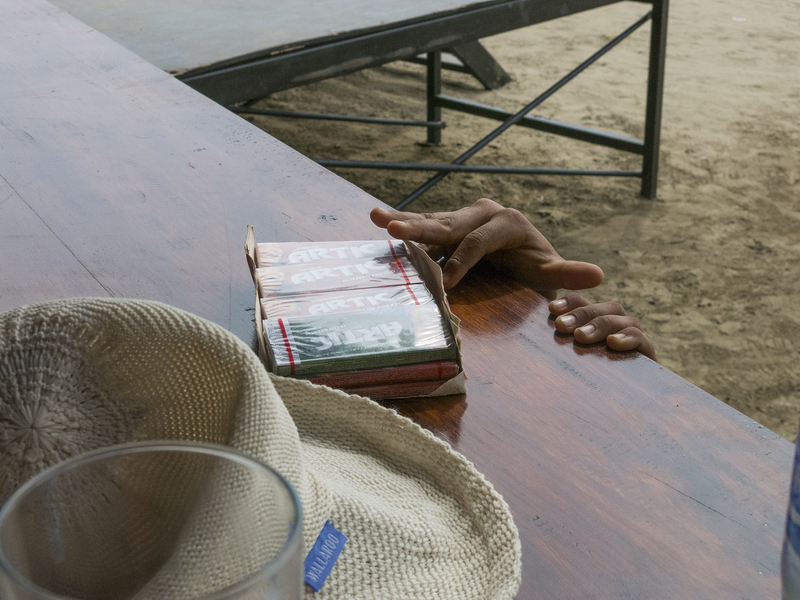 While waiting on our meal, and savoring a Nicaraguan Toña cerveza, the occasional hawker would meander by to offer up their wares—hand wrought bracelets, pottery, knock-off sunglasses, and such. And then this tiny fellow, who could only just barely reach our table top, pushed up his chicle supply. I told him I’d buy a pack of gum, but that he should keep it and resell it to the next chew-needful Gringo. He shyly accepted my offer, and slipped off to other sales opportunities. Take that Daniel Ortega, Anastasio Somoza, and whoever else would hold down, or corruptly prey on these fine people in their volcanic land.